It all comes down to finding a work-life balance. Go to school, get a job and keep making money. That's the goal, but sometimes you end up dreading your dream job. 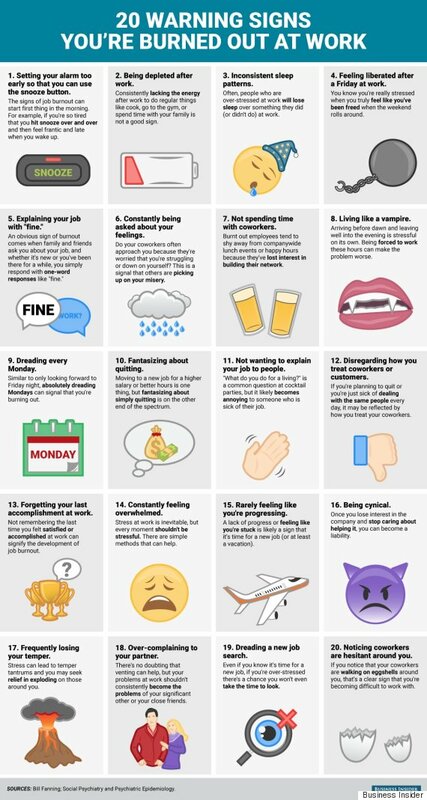 In the infographic below by Business Insider, we learn the 20 warning signs that indicate you are approaching job burnout. From hitting the snooze button more frequently to avoiding conversations about work, these signs go much further than just fantasizing about how you're going to quit. Work burnout can occur at all levels of employment. In 2011, Forbes reported that millennial women were burning out before turning 30. The reason? These women pushed themselves through school and work and became exhausted within the first few years of employment. Burning out at work is a type of mental stress, says the Mayo Clinic, which identifies burnout at physical and mental exhaustion combined with doubts of competency. Like overworking, job burnout is a known cause of strokes. The pressure of work stress has also been found to be as deadly as secondhand smoke. And the effects go far beyond your health. Job burnout can also destroy relationships and self confidence. Do you recognize any of these symptoms in yourself? Let us know in the comments below.